Government funding changes the composition of boards, the way nonprofits function, and the lines of accountability. What can you—and should you—do about it? NPQ’s listing of consultants from across the nation from 2007. Is it easier to steal from a nonprofit organization than from a business? That’s what some researchers have speculated. To identify how people steal from nonprofits and how to prevent it, we turned to the biannual surveys of fraud examiners. Shady spousal dealings, complicated board loyalties, and the IRS, all in this edition of the Ethicist! The cover image of this Winter edition of the Nonprofit Quarterly is a little dark and stark, as befits the winter solstice before we light the lights and candles to cheer us. 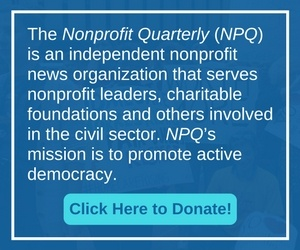 NPQ hopes you are safe and warm, but it wants to contribute its own bright moment to those who work in the nonprofit sector with a landmark study that indicates that nonprofit leaders out-perform business leaders. This study, conducted by Community Resource Exchange and Performance Programs Inc. compares the results of the 360-degree evaluations of the two groups, finding that, while nonprofit leaders rated themselves approximately on par with how business leaders rated themselves, peers, superiors, and direct reports actually rated nonprofit leaders higher than those of for-profit leaders in 14 out of 17 categories. This comes as no surprise to the NPQ editors who understand the challenges of the role, and we were glad to find that it came as no surprise to Jim Collins, world-renowned author of the classic management books, Built to Last and Good to Great. He explains why nonprofit leaders may be perceived as more capable by those with whom they work. One of the nonprofit sector’s flagship organizations and a cultural icon has another new strategy. Will it work? When an organization’s culture needs to be revitalized, the starting point needs to be each member’s own behavior.